Much has been said about the decline in volatility. At the moment I am very active in FX spot trading and as a generalization do better the more vol there is. 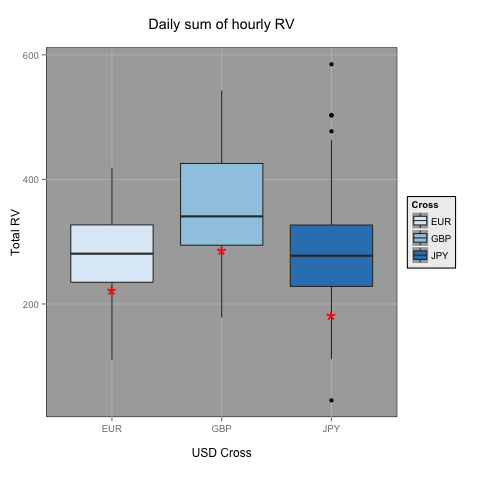 I wanted to see how things stood on the crosses I am most active in, namely EUR/USD, GBP/USD and USD/JPY. I took hourly data from FxPro (not my broker, nor an endorsement), calculated volatility as the high minus the low, and summed the total for each day. You can think of it as how many pips were on offer if one could correctly call the high and low of each hour of each day. All up there is about 90 days of data, so it covers roughly the last four months. I also took the average of the last five days which are the red X’s on the box plots. We are here. As you can see, vol is below average. It was quiet week overall, bank holidays in the US and parts of Europe, and only a moderate amount of data coming out. Next week should be a bit busier I think. 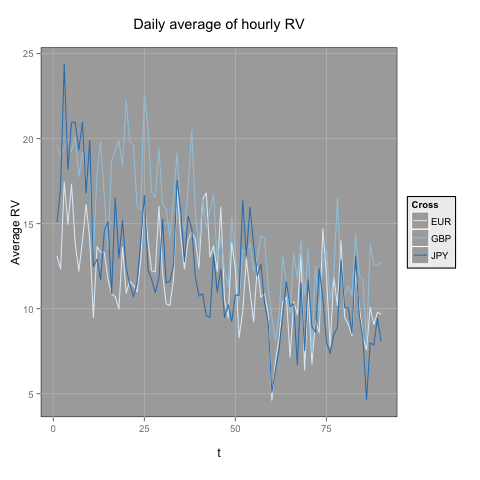 Since I had all the data I also took at look at the average hourly RV per day. I don’t want to read too much into this chart but things have been quiet. I read somewhere else fx vol is approaching levels of 2007 which was a very quiet time indeed. Some R code is up here, data is here.